Give sneak peaks, exclusive offers, early access. Ask for opinions, give contributions to non profits, hold special events, give access to company leaders and VIP events. How do you thank your Brand Advocates and let them know they matter? I advocate for Whole Foods and Whole Foods Virginia Beach because I enjoy their employees, service and The Porch. From buy one get one free pizzas on Tuesdays, to daily specials and rare beer tappings at The Porch, Whole Foods is one of my favorite places to go in Virginia Beach. I often tweet, post on Instagram and Facebook about Whole Foods' happenings, favorites and getting work done there (yes, beer + blogging) because I'm an Advocate, not because I expect anything in return. Advocates evangelize you without payments or points, coupons or cash. You can't buy authentic Advocates. their advocacy is not for sale, but you can thank them. Even after living and breathing Brand Advocacy for 4 years and being a social media strategist, I'm still blown away and grateful when brands recognize their Advocates. 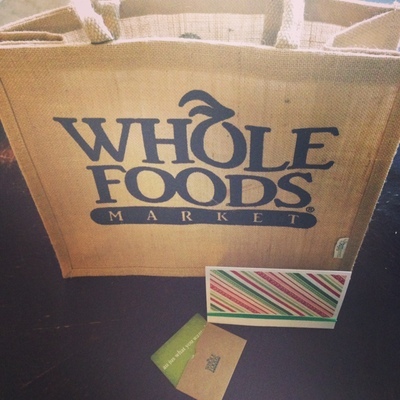 Yesterday, Whole Foods Virginia Beach sent me a direct message on Twitter and I was so excited. I grabbed a coffee from The Porch first thing this morning, then headed over to customer service to see what was left for me. Maria could have just sent me a tweet thanking me and that would've been satisfying, but she took the extra step to send some cheer my way. 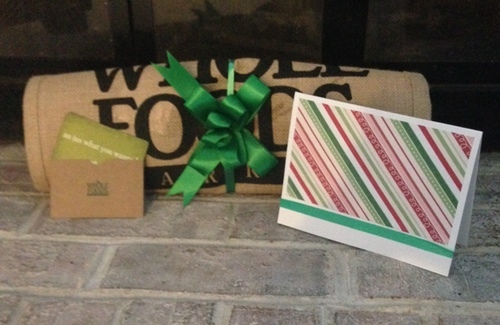 A handmade card, handwritten note, gift card and a reusable burlap bag. Awesome. Of course brands can't do this for all of their Advocates, and it's not expected that they do, but a simple tweet, thank you note or even an email saying You Rock, does the job. Failing to recognize your Advocates can make them less likely to recommend you. How do you thank your volunteer sales and marketing force? Your Advocates are everywhere, are you ready to identify, energize and thank them? Let's chat!